Apple’s iPad event has just wrapped up and with it we saw an updated MacBook Pro with Retina Display lineup, together with all new price points. Together with this, Apple announced the latest versions of their iPad lineup. Named the iPad Air and iPad Mini with Retina Display, they represent what Apple claim is the biggest step forward in the iPad since it was originally released. The iPad Air features a design that we were all expecting, inheriting the slimmer bezel and thinner design found in last years iPad Mini. The screen size remains at 9.7-inches but the profile of the iPad Air has been reduced with the thinner appearance, as well as being 20 percent thinner than the previous iPad 4 at 7.5mm thick, weighing in at just 1.0 pounds, which is 28 percent lighter than the previous model. As mentioned, the screen size stays at 9.7-inches with the Retina Display packing 2048 x 1536 pixels into the display. In addition, the iPad Air features a 64-bit A7 processor and M7 motion coprocessor which are also found in the iPhone 5S. Apple says it provides 8 times the performance and 72 times better graphics rendering than the old processor. The iPad Air will be available in silver and white and space grey and black color options starting at $499 in numerous countries on November 1st. An LTE version will be available starting at $629. 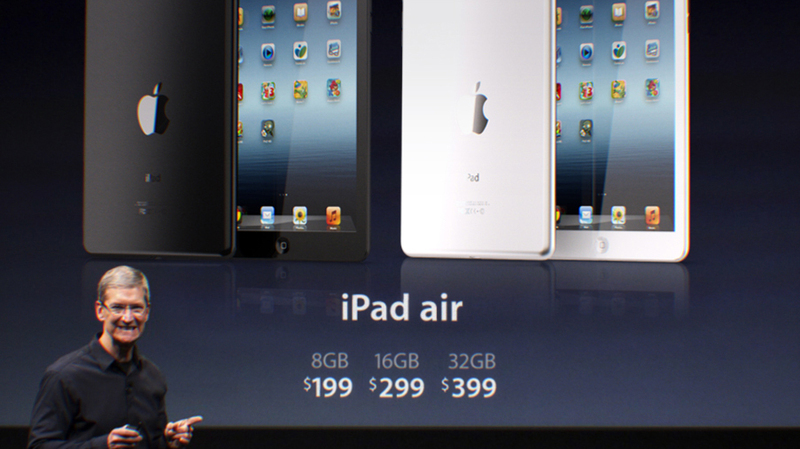 Apple is also keeping the iPad 2 in the lineup for $399. The iPad Mini with Retina Display was also released which introduces a 2048 x 1536 resolution to the 7.9-inch screen of the iPad Mini. It’s also been updated to the 64-bit A7 processor but to cover these costs Apple are increasing the price up to $399 for a 16GB Wi-Fi model and $529 for the LTE model. Which one will you be getting? Apple are accepting orders for the two new iPad models now.